Well, OdenedO worked out that it is a skirt (or apron) and Sam Kelly and Julie Doyle both correctly suggested that it was African in origin. Jake and Julie Doyle suggested that it could be ivory and Sam Kelly specified that it could be Hippopotamus teeth (although this suggestion was discarded in favour of horn). So a bit of a group effort, but you pretty much got there – it’s an African (Ethiopian in fact) skirt/apron made using ivory, probably Hippopotamus incisors. That’s my current preferred hypothesis based on the photo – but I need to check the specimen myself to be entirely sure. 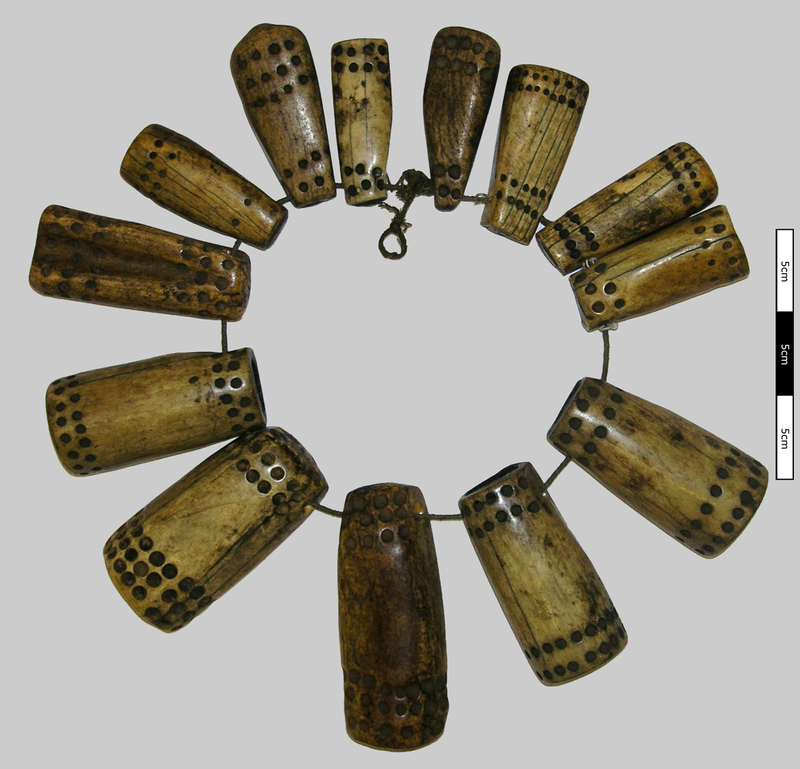 Ivory (teeth as a workable material) is an interesting area for us in the museum trade, since most kinds are controlled by the Convention on International Trade in Endangered Species of Wild Fauna and Flora (CITES). This means that objects made of certain types of ivory need to have licenses for import and export, or for any commercial use, unless they can be shown to have been made before 1st June 1947. But there are other clues that can indicate which species an ivory has come from – unfortunately I don’t have time or the appropriate images to go into detail here, so I will pull together a post on identifying ivory as soon as I can. For now, here’s a link to a useful pdf article on this very topic. Back to the skirt/apron – anthropology isn’t my area of expertise, but to the best of my knowledge this sort of attire is largely an indicator of status rather than a practical piece of clothing. In other African cultures beaded aprons are given to young women when they marry, so this may fulfil a similar purpose. I will try to track down some more on this – I think it may be included in one of the Horniman’s planned exhibitions in the next couple of years, so there may be a lot more information forthcoming. I’ll keep you posted. I’m sure I’ve seen something like this, with very specific explanation of the meaning on the dotted beads. But I’ve no idea when or where. Or what. Or probably how or why either. Even now, it’s not coming back to me. Excuse my ignorance but to me it looks like a protable dominoes game. Very handy, on a string like that! Not wanting to seem like I’m focusing in on the wrong kind of issue here, but isn’t it a bit on the scanty side for a skirt?